Explanation: Stars of the Hyades cluster are scattered through this mosaic spanning over 5 degrees on the sky toward the constellation Taurus. 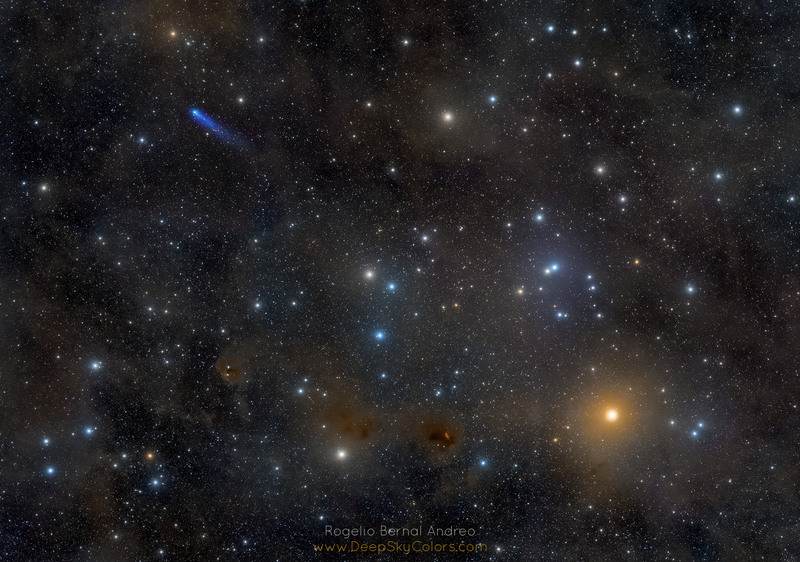 Presently cruising through the Solar System, the remarkably blue comet C/2016 R2 PanSTARRS is placed in the wide field of view using image data from January 12. With the apex of the V-shape in the Hyades cluster positioned near the top center, bright Aldebaran, alpha star of Taurus, anchors the frame at the lower right. A cool red giant, Aldebaran is seen in orange hues in the colorful starfield. While the stars of the Hyades are gathered 151 light-years away, Aldebaran lies only 65 light-years distant and so is separate from the cluster stars. On January 12, C/2016 R2 was over 17 light-minutes from planet Earth and nearly 24 light-minutes from the Sun. Its blue tinted tail largely due to CO+ gas fluorescing in sunlight, the head or coma of the comet appears with a slightly greenish hue, likely emission from diatomic carbon.